The 1872 match between Scotland and England was the first ever association football official international match to be played. It was contested by the national teams of Scotland and England. The match took place on 30 November 1872 at West of Scotland Cricket Club's ground at Hamilton Crescent in Partick, Scotland. The match finished in a 0–0 draw and was watched by 4,000 spectators. 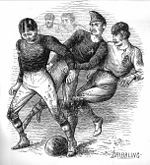 Following public challenges issued in Glasgow and Edinburgh newspapers by The Football Association (FA) secretary Charles Alcock, the first encounter of five matches between teams representing England and Scotland played in London took place on 5 March 1870 at The Oval, resulting in a 1–1 draw. Scotland did not record a win in all five matches. The second match was played on 19 November 1870, England 1–0 Scotland; 25 February 1871, England 1–1 Scotland; 18 November 1871, England 2–1 Scotland; 24 February 1872 England 1–0 Scotland. All players selected for the Scottish side in these early "internationals" were mainly from the London area, although Scottish players were invited from Scotland. The only player affiliated to a Scottish club was Robert Smith of Queen's Park FC, Glasgow, who played in the November 1870 match and both of the 1871 games. Robert Smith and James Smith (both of the Queen's Park Club) were both listed publicly for the February 1872 game, but neither played in the actual match. Alcock then proceeded to offer another challenge with a Scottish team drawn from Scotland and proposed the north of England as a venue. 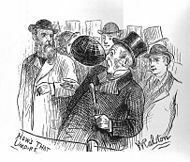 Alcock appeared to be particularly concerned about the number of players in Scottish football teams at the time, adding: "More than eleven we do not care to play as it is with greater numbers it is our opinion the game becomes less scientific and more a trial of charging and brute force... Charles W Alcock, Hon Sec of Football Association and Captain of English Eleven". One reason for the absence of a response to Alcock's challenge may have been different football codes being followed in Scotland at the time. A written reply to Alcock's letter above states: "Mr Alcock's challenge to meet a Scotch eleven on the borders sounds very well and is doubtless well meant. But it may not be generally well known that Mr Alcock is a very leading supporter of what is called the "association game"... devotees of the "association" rules will find no foemen worthy of their steel in Scotland". Despite this the FA were hoping to play in Scotland as early as February 1872. In 1872, Queen's Park, as Scotland's leading club, took up Alcock's challenge, despite the fact there was as yet no Scottish Football Association to sanction it as thus. In the FA's minutes of 3 October 1872 it was noted "In order to further the interests of the Association in Scotland, it was decided that during the current season, a team should be sent to Glasgow to play a match v Scotland". The match was arranged for 30 November (St Andrew's Day), and the West of Scotland Cricket Club's ground at Hamilton Crescent in Partick was selected as the venue. All eleven Scottish players were selected from Queen's Park, the leading Scottish club at this time. Scotland had hoped to obtain the services of Arthur Kinnaird of The Wanderers and Henry Renny-Tailyour of Royal Engineers but both were unavailable. The teams for this match were gathered together "with some difficulty, each side losing some of their best men almost at the last moment." The Scottish side was selected by goalkeeper and captain Robert Gardner. The English side was selected by Charles Alcock and contained players from nine clubs; Alcock himself was unable to play due to injury. The match, initially scheduled for 2pm, was delayed for 20 minutes. The 4,000 spectators paid an entry fee of a shilling, the same amount charged at the 1872 FA Cup Final. The Scots wore dark blue shirts. This match is, however, not the origin of the blue Scotland shirt, as contemporary reports of the 5 February 1872 rugby international at the Oval clearly show that "the Scotch were easily distinguishable by their uniform of blue jerseys.... the jerseys having the thistle embroidered." The thistle had been worn previously in the 1871 rugby international. The English wore white shirts. The English wore caps, while the Scots wore red cowls. The match itself illustrated the advantage gained by the Queen's Park players "through knowing each others' play "as all came from the same club. Contemporary match reports clearly show dribbling play by both the English and the Scottish sides, for example: "The Scotch now came away with a great rush, Leckie and others dribbling the ball so smartly that the English lines were closely besieged and the ball was soon behind", "Weir now had a splendid run for Scotland into the heart of his opponents' territory " and "Kerr.. closed the match by the most brilliant run of the day, dribbling the ball past the whole field." Although the Scottish team are acknowledged to have worked better together during the first half, the contemporary account in the Scotsman newspaper acknowledges that in the second half England played similarly: "During the first half of the game the English team did not work so well together, but in the second half they left nothing to be desired in this respect. " There is no specific description of a passing manoeuvre in the lengthy contemporary match reports, although two weeks' later The Graphic reported "[Scotland] seem to be adepts at passing the ball". There is no evidence in the article that the author attended the match, as the reader is clearly pointed to match descriptions in "sporting journals". It is also of note that the 5 March 1872 match between Wanderers and Queen's Park contains no evidence of ball passing. On a pitch that was heavy due to the continuous rain over the previous three days, the smaller and lighter Scottish side pushed their English counterparts hard. The Scots had a goal disallowed in the first half after the umpires decided that the ball had cleared the tape. The latter part of the match saw the Scots defence under pressure by the heavier English forwards. The Scots played two full backs, two half backs and six forwards. The English played only one full back, one half back and eight forwards. Since three defenders were required for a ball played to be onside, the English system was virtually a ready-made offside trap. Scotland would come closest to winning the match when, in the closing stages, a Robert Leckie shot landed on top of the tape which was used to represent the crossbar. At some point in the game, the England goalkeeper, Robert Barker, decided to join the action outfield when he switched places with William Maynard. Mitchell, Andy (2012). First Elevens, the birth of international football. Andy Mitchell Media. ISBN 9781475206845. ^ a b c d e f g h i Paul Mitchell. "The first international football match". bbc.co.uk. Retrieved 23 September 2007. ^ Bell's Life in London and Sporting Chronicle, 24 February 1872. ^ Bell's Life in London and Sporting Chronicle, Saturday 17 February 1872. ^ a b Charles W Alcock, The Scotsman newspaper, 28 November 1870, page 7. ^ The Scotsman newspaper, 1 December 1870, page 12. ^ Glasgow Herald (Glasgow, Scotland), Tuesday, 13 February 1872; Issue 10022. ^ a b c The Graphic (London, England), Saturday, 14 December 1872; Issue 159. ^ a b c d The Scotsman – Monday, 2 December 1872, page 6. ^ Bell's Life in London and Sporting Chronicle (London, England), Saturday, 9 March 1872; Issue 2,697. ^ Tape was used before crossbars were introduced in Scotland, although crossbars were being used under the Sheffield Rules at this time. See: The term "crossbar" used by Sheffield as early as March 1872: Bell's Life in London and Sporting Chronicle (London, England), Saturday, 9 March 1872; Issue 2,697. 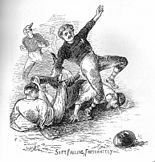 Wikimedia Commons has media related to Scotland v England, association football, 1872.